This method is the most common approach. Quick, simple and effective in most scenarios. To mirror an object with the Scale Tool you will need to select the object first. It can be raw geometry, grouped geometry or components. Next you need to copy that object. The quickest way to duplicate this is to use the CTRL + Move. With the duplicate positioned you can then Scale negatively to mirror the original object. Make sure you grab the correct scaling handle. For the supercharged method we can thank TIG for his popular Mirror extension for SketchUp. 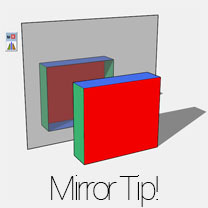 To mirror an object with Mirror you only need to select the object and then activate Mirror. Draw your mirror location and boom! Job done. So there you have it. 3 ways to mirror an object in SketchUp.